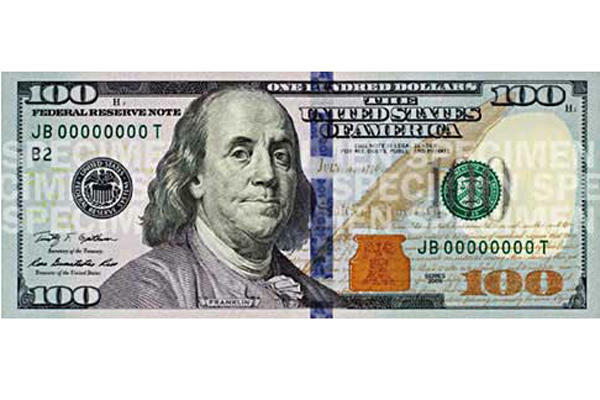 On Wednesday, the US Treasury introduced a new 100 dollar bill, which is slated to go into circulation early in 2011. The new 100 dollar bill includes a "3D Security Ribbon" and a color-changing inkwell. Benjamin Franklin gets to stay. So does the official stamp of the Federal Reserve System. But the rest of the $100 bill – the most frequently counterfeited note, according to government officials – is getting a radically revamped look. 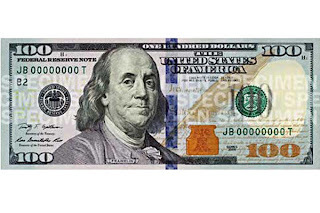 On Wednesday, the US Treasury took the wraps off of a new $100 bill, which Treasury Secretary Tim Geithner says would be exponentially more difficult for criminals to copy. "As with previous US currency redesigns, this note incorporates the best technology available to ensure we're staying ahead of counterfeiters," Mr. Geithner says in a statement. So what's so great about the new $100 bill, anyway? In a word: state-of-the-art science. The new $100 bill gets an array of security features, including an image of the Liberty Bell which reportedly changes color from copper to green when the note is tilted. But the biggest upgrade is a blue "3D Security Ribbon." That's right: the same 3D craze that swept through movie theaters, television screens, and video game systems, is now coming to the pocket of a well-heeled American near you. US Treasury says the 3D ribbon would appear on the front of new $100 notes, which are set to enter circulation in February 2011. The strip contains a series of images of bells and digits; tip the note, and the images come into 3D relief. 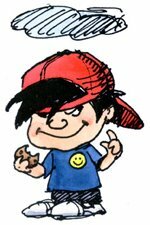 And you don't even need a pair of those dorky 3D glasses to make sure you're looking at a genuine Benjamin. "It only takes a few seconds to check the new $100 note and know it's real," says Larry R. Felix, Director of the Treasury's Bureau of Engraving and Printing.